Unlimited MTN free browsing, I tagged it rush hour because it speed was like Super Mario Game. Now it is the turn of my MTN Users, enjoy unlimited browsing on your mtnline. 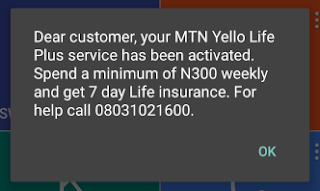 Though it required a subscription called MTN Yello Life Plus, but the good news is that, you don’t need to have airtime on your account before you can get it done and the code is working fine with the old and new MTN SIM cards. The plan can be activated with N0.0 and it’s blazing well on all devices once activated.